If you are living in the Northeast anxiously waiting for the “historic” blizzard that according to National Weather Service may drop up to 3 feet of snow on Boston and New York – you will probably have compassion with this family living in Voss municipality in Western Norway. 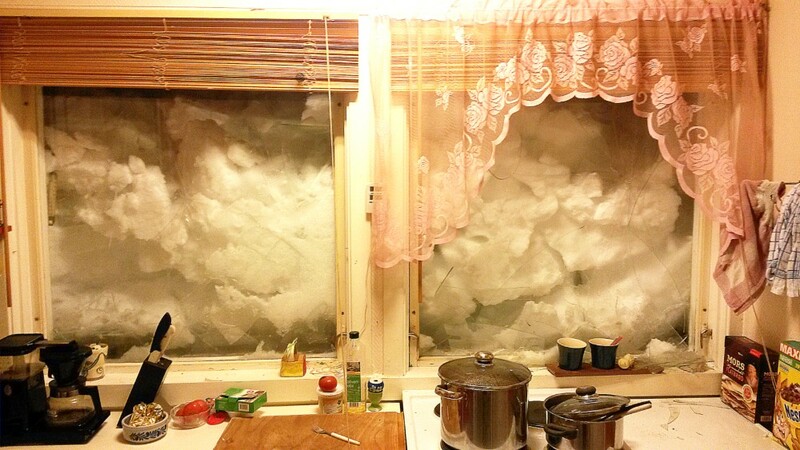 Saturday night, when Øyvind Lennart Pedersen was in the kitchen making food, a big bang came from the windows. – The whole house was shaking, and drinking glasses fell out of the kitchen cabinet, he says to NRK Hordaland. He says that they have shoveled the roof but that it is about two meters (7 ft) of snow on the ground outside, in addition to the snow that has fallen from the roof. As a consequence, the family has not been able to look out the kitchen window for weeks. – There is so much snow that there are no places to put it, Pedersen says. On Saturday night, when he was standing in the kitchen, the blackout curtains were drawn. Suddenly, the bang came without any warning. – We were quite shocked. It felt like my heart stopped. – We moved here because of the snow, but this is a bit too much, says Pedersen. I worked as a consultant on the Statoil methanol plant in Schelbergooden (ok, I know I spelled it incorrectly). I was impressed by the people and the country. One weekend I drove from Kyrksaeteora to Stavanger to make a meeting on Monday. The most spectacular scenery I have ever seen. I have not seen everything, but I have been around to many places in the world— all the continents but Antarctica. That weekend drive was the best sights of all.